The room was exceptionally large, great if your travelling with a pet. Check In very quick and easy to complete, excellent receptionist who gave us all the information on the hotel facilities. Beautiful location, I couldn't choose a better spot. Kids and dog very friendly, fun and cosy atmosphere. The bedroom was perfect temperature, very good shower and comfortable beds. The window has a extra feature that allows you to make your bedroom completely dark even during the day. I paid very cheap for the breakfast and it worth it, deliciosos! I hope to come back to this hotel soon, just perfect! Very clean room, comfortable bed, beautiful area, bath and shower with hot water. Very nice stay. We love the location and the staff were superb. Lovely views, the piol (wich is a bit cold) and the tennis court, lovely walks on the countryside. The staff is fantastic!!! El hotel estaba bien con piscina buena relación calidad precio, lo mejor los dueños y la atención que ponen en sus los clientes. Te hacen sentir como en casa. Poco ruidoso. La chica de los desayunos encantadora y servicial. Las vistas. ME GUSTO TODO MUCHO: EL ESTUDIO MUY LIMPIO,EL PERSONAL MUY AMABLE, MUY BUENA UBICACION..
Hotel Sandra II This rating is a reflection of how the property compares to the industry standard when it comes to price, facilities and services available. It's based on a self-evaluation by the property. Use this rating to help choose your stay! Enjoy the tranquility and fantastic views offered by this riverside setting, 2,300 feet from central Suances. An indoor pool is available. Free WiFi is provided in public areas and free public parking is available on site. Rooms feature a flat-screen TV and mini-bar. The bathroom comes with bath and hairdryer. Play a game of tennis in the fresh air on the Sandra II’s outdoor courts. 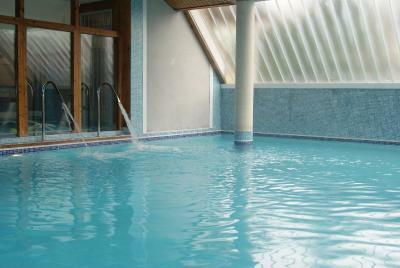 An indoor pool is also available. For a more relaxing time, head to the garden and terrace to enjoy the views. Here you can also enjoy a refreshing drink from the hotel cafe. The Sandra II sits on a clifftop overlooking the estuary of the River Besaya, which continues past Suances and into the Bay of Biscay. Just 1.2 mi from the hotel you will find the town’s 3 beaches and the seafront promenade of this charming Cantabrian city. When would you like to stay at Hotel Sandra II? This room features a flat-screen TV and a mini-bar. The bathroom comes with bath and hairdryer. This spacious room features a flat-screen TV and a mini-bar. The bathroom comes with bath and hairdryer. 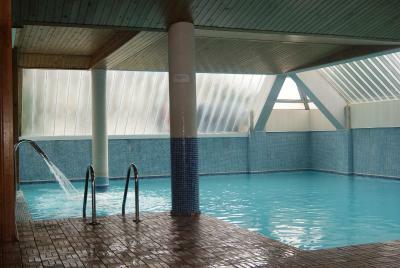 The Hotel Sandra II is situated near the Plaza Mayor of the town and close to the beaches and boardwalk. Enjoys a privileged setting surrounded by nature in a residential area , on a cliff with stunning views of the valley of Ria San Martin. House Rules Hotel Sandra II takes special requests – add in the next step! Hotel Sandra II accepts these cards and reserves the right to temporarily hold an amount prior to arrival. Staffing at property, on arrival had to wait over 10 mins to get some one to attend reception desk and book in. On Check out they tried to charge extra for breakfast. We had booked the room inclusive of breakfast. This property is overpriced as it lists number of facilities, but none of them available.